Home Health Care is a boon to many, especially if you have an ailing elder, someone recovering from an accident or injury, or a terminal patient on your hands. There are many options these days for home care as well as a host of advantages. People are more comfortable in their own homes than in a nursing home and it aids recovery. They also have a decreased risk of developing infection from exposure to germs and therefore have fewer hospital readmissions. Home health care staff are trained in nursing and basic medical treatment. Trained and qualified professionals can assess safety risks and make emergency decisions. Necessary help can be given immediately. When you are the only one looking after the elderly or ailing at home, the task can take a toll on you. Having somebody to share the burden makes it easier. Very often, patients need help with daily living and personal care, which could include bathing, grooming and nutrition. Whether your loved one is recovering from surgery or an accident, after care is important. Inadequate after care may lead to a relapse and readmission. If family members are unable to provide proper aftercare, hiring a professional service is a good idea. When you have elderly relatives who are living alone and if they’re sick in some way, it will give you peace of mind to have someone to take care of them around the clock. Being able to pick up the phone wherever you are and check in on your senior or aged and to find out that they are safe and well looked after will ease your mind. Keeping someone in a hospital or nursing home for a long period can be very expensive. With home health care services you can get personal care at home and it will be much more cost effective. For many families, home health care can be just the support they need to help manage care giving responsibilities, while avoiding caregiver burnout. If you or your family member is considering in-home care in Chennai, contact Sirina Home Health Care Services. They are dedicated to supporting families in times of crisis and helping the aged enjoy life in the comfort of their own home for as long as possible. 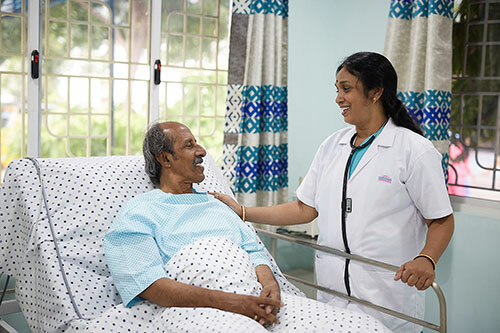 Some of the services offered by Sirina Home Health Care Services include post-operative care, palliative care, diet monitoring, medication management, symptom control, wound management, counseling, physiotherapy, ambulation, intravenous therapy etc. They are located in Mylapore and offer their services to all parts of South Chennai. Call 91 9025887777 or visit http://sirinahealth.com/ to find out more about their services.